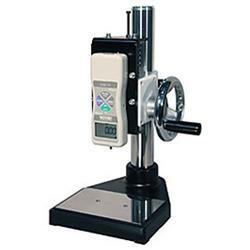 Model SVH-220 are compact test stands with a maximum capacity of 220 lbs. The hand wheel offers precise movement that is ideal for applications requiring relatively consistent speed and maximum gauge control. The gauge remains in position when the wheel is released which allows the user to easily change samples between tests. Hand wheel operation provides repeatable test results from sample to sample. The stroke can be adjusted with a mechanical limit. 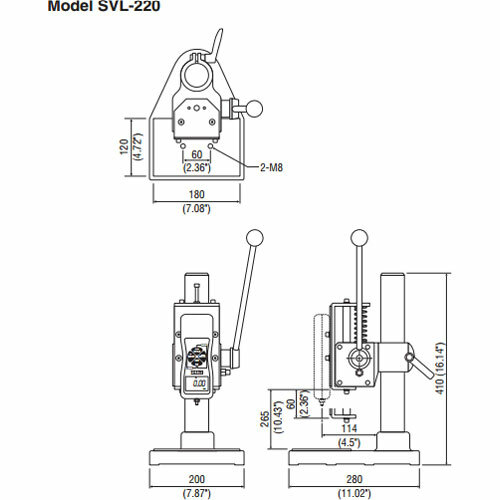 Model SVH-220 are compact test stands with a maximum capacity of 220 lbs. The hand wheel offers precise movement that is ideal for applications requiring relatively consistent speed and maximum gauge control. The gauge remains in position when the wheel is released which allows the user to easily change samples between tests. Hand wheel operation provides repeatable test results from sample to sample. The stroke can be adjusted with a mechanical limit. The SVH-220 accommodate any of the standard range Imada mechanical or digital force gauges.